Well, a week of spring training has gone by without my physical presence at a Grapefruit League game (now spiritually, that’s another story). Luckily, hope is not lost; in fact,hope is never lost in spring training because of Alexander Pope’s immortal words: “hope springs eternal”. Everyone thinks they have a shot of making the playoffs, and everyone does. You never know what could happen throughout the course of the season. The most unlikely of heroes could emerge and carry his team to the playoffs. Spring Training is where it all begins. After 12 straight, agonizing weeks of school, I am on spring break. I have baseball to thank for my survival. Its return late February has been therapeutic among the daunting tasks of being a second semester junior. From a research paper to building a bridge to taking the SAT to starting to think about where I want to go to college: I’ve had a lot on my plate. Going to a baseball game almost every weekend in March has been a big help. 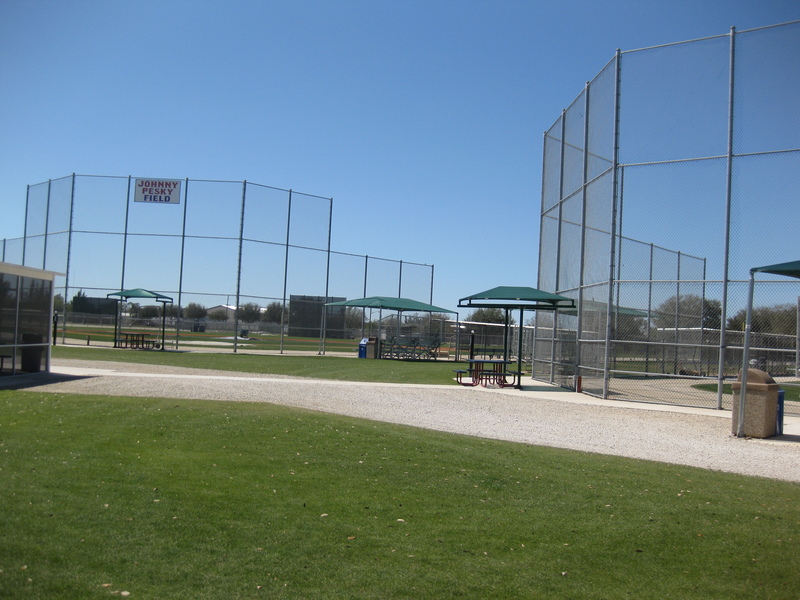 As many of you have probably guessed, spring training is my favorite time of year. I know that statistically, the games are worthless, but they mean the world to me. It may be a different atmosphere than the regular season, but that’s another reason why I love it. It is so much more intimate and laid-back. I can trespass without severe legal consequences, and I can get closer to the players than I ever could during the regular season. Perhaps my favorite part is that I can watch the present players and the players of the future at the same time. I have to say, right now, my heart is with the prospects. I feel like I can relate to them a bit more. They want to make it to the big leagues; I want to make it to the big leagues of sports journalism and broadcasting. As some of you know, I make a list of projects every year during Spring Training. These projects are the guys who have impressed me the most throughout Spring Training. I have been doing this since the 2008 season. Jed Lowrie and Justin Masterson were my first projects. I have made some minor refinements to the program though. Originally, the projects were limited to the guys whom I thought would make a significant impact on the team during that specific season. Well, as I have become more enthralled with spring training, I have realized that some of these guys might not make a significant impact until the next year or the year after that. Sometimes the Red Sox just don’t have the spots available for these guys yet; sometimes they just need more development in the minors. In other words, I am going to divide up my projects into sections. Being my project is a very special honor, and I highly recommend that you choose a project or two yourself. Not to mention the fact that they love the fact that they’re my projects, especially once I tell them how venerable the program is. I think Bowden and Richardson could both serve huge roles in the bullpen. As of right now, the Red Sox are set on finding another lefty specialist for their bullpen, but none of the candidates have performed promisingly. Why do we (or anybody for that matter) need a lefty specialist? How about just a specialist: a guy who can simply get outs? What’s the difference if the batter is a lefty or a righty? It doesn’t matter for guys like Jonathan Papelbon or Daniel Bard. Bard doesn’t discriminate! He blows 100 mph by lefties and righties alike! In other words, I don’t think the Red Sox should be wasting their time looking for a lefty specialist. They should be looking for a solid relief pitcher who can simply get batters out. As of right now, I think Scott Atchinson can fill that role the best. Bowden and Richardson still need some seasoning in the minors (especially Richardson since he didn’t get a lot of spring training action because of a fatigued left quad). In the long run, my intuition says Bowden and Richardson. Josh Reddick has had a fantastic spring to say the least. I would be crazy if I didn’t make him my project! The Red Sox already have four outfielders in Ellsbury, Cameron, Drew, and Hermida, but injuries are inevitable. Mark my words: the first guy to get a call-up for an outfield spot will be Josh Reddick. Aaron Bates worked hard in the winter leagues, and has had a pretty solid spring as well. He even had a few short stints in the bigs last season. The Red Sox have a lot of options when it comes to first base in Youkilis, Victor Martinez, and Lowell. If there is ever an opening for a first baseman, Aaron Bates should get the call. I think that Weiland will take a path similar to Richardson’s last year: he will come up and impress when rosters are expanded in September, and then will make a significant impact in the 2011 season. Ryan Kalish will take a path similar to Reddick’s. Doubront and Tazawa will take a path similar to Michael Bowden’s. Anderson needs to build up his confidence and have a nice comeback year. Easier said than done, right? I have confidence in him though. The only reason I don’t mention Casey Kelly in the September call-ups portion is that I really think we need to take it slowly with him. Remember this is his first full year as a pitcher. I’m sure he is going to blow everyone away in Portland; I’m just especially hesitant with pitchers because I think the transition from the minors to the majors is the biggest for them, and it’s so tough mentally too. 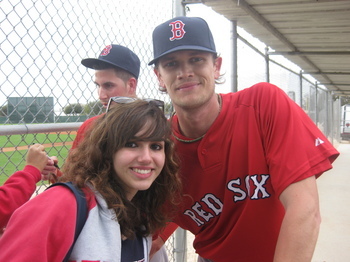 I feel like the organization rushed Buchholz, and he was just not mentally ready yet. I suppose this is why they’re taking it slow with Bowden now. ction last year as a September call-up. He also had a bit of a rude awakening (and I say rude because he was thrown into the bullpen–a totally different mentality–after being raised as a starter). Now, he’s trying to regain his confidence. He will be the first guy to be called up when the Red Sox need an emergency starter or another arm in the bullpen. Obviously, Casey Kelly’s confidence is going to be shattered at some point. It happens to everybody. It happened to Bard last year, it’s going to happen to Richardson, Weiland, Johnson, Doubront, and the rest of them. All I’m saying is that the Red Sox need to be cautious with these guys and not rush them along too quickly. I’ve seen Kris Johnson both start and relieve a game, so I would like to see what he is going to do in Pawtucket before I move him any further in the project program. I have really liked what I’ve seen so far in Nate Spears. I feel like he could be what Nick Green was to the team last year. I understand that the Red Sox picked up Frandsen from the Giants because he’s a utility infielder and Jed Lowrie has mono and Bill Hall hasn’t been all that impressive in the infield. I think Spears is perfectly capable though. Hazelbaker is very young, but expect him to be a non-roster invitee next year! *The only reason Ryan Westmoreland is not on this list is because I think that it is important for him to simply recover before he even thinks about baseball. Like I’ve said before, he will always have my support; I just want him to get better right now. There is no timetable for his return yet. The most anybody knows is that the surgery was as successful as it could have been… it’s just a long road to recovery. If anybody can do it, he can. The Red Sox have had a pretty uneventful spring. No big roster battles like last year at shortstop, or the battle between Jeff Bailey and Chris Carter for the last bench spot. By the way, both Carter and Bailey are having fantastic springs for the Diamondbacks and Mets, respectively. 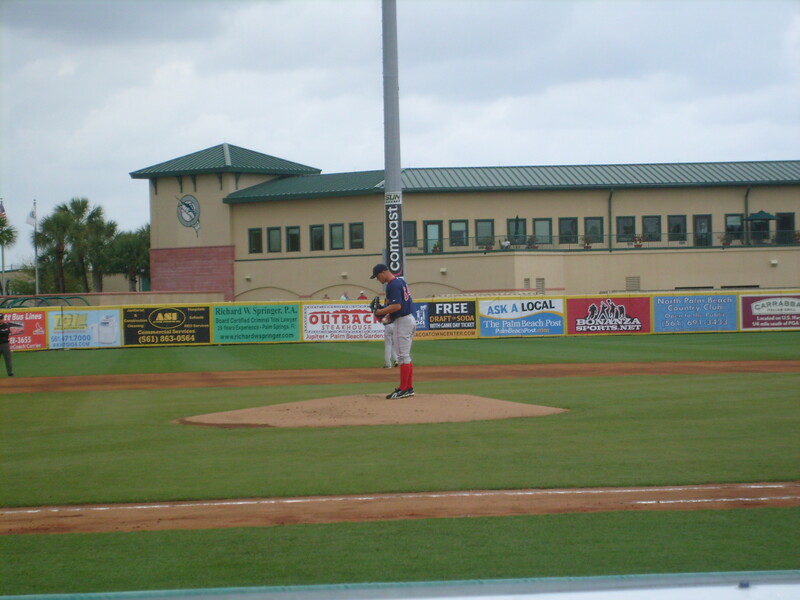 The biggest thing in my opinion is the potential contract extension with Josh Beckett. Long story short: he was offered four years (money figures are unknown as of right now). I don’t know what to think of him being offered only four years. Look at some of the recent contract offers to pitchers: Dice-K, the phenom turned health liability from Japan, was given six years before he had even thrown a pitch in Major League Baseball (granted he was very successful in Japanese pro-ball). Lackey, arguably the best free agent pitcher on the market was given five years. Beckett, the 2007 ALCS MVP and should-have-been Cy Young award winner has given a lot to the Red Sox. Inconsistent at times, but a workhorse overall. That being said, only four years?? This is a contract extension, not an entirely new contract (that would result from free agency). Thus, it does not include the 2010 season, so technically the Red Sox would have him for five more years, but ever since Burnett signed with the Yankees for five years, that seems to have become the standard for pitchers. Just look at King Felix and Justin Verlander: both guys signed five year contract extensions if I am not mistaken. Beckett is 30 years old; he’s still a very young guy with a lot to offer. If the Red Sox mess up negotiations with him, we all know that he is going to end up in pinstripes, and that is the last thing we want to see. Intimidating right? Look, all I’m saying is to give Beckett what he deserves, and I think that he deserves five years. It’s kind of a similar situation with choosing the Opening Day (or in this case, night) starter: you give it to the guy who has paid his dues for the team. Josh Becket is starting opening night because he has earned the honor. Similarly, he deserves the standard “five-year contract extension” because he has earned it from paying his dues. He is going to pitch his heart out in this contract year, so I sincerely hope that the Red Sox can secure him before free agency starts. A similar situation applies to Victor Martinez. Joe Mauer signed that 8-year $184 million deal with the Twins earlier this week. Much as I would have loved to have Mauer in a Red Sox uniform, I have to say that I’m really happy that he is staying with the Twins. He is their hometown hero. That’s what baseball should be about: playing where your heart is, not going for the money. Martinez will be a free agent after this season, and he is still relatively young as well (31, I believe). I think that a two to four year extension for V-Mart would be very nice. He doesn’t even have to catch all of those years. Martinez could move to first (with Youk moving to third) and Luis Exposito could catch. Martinez is one of the few good hitting catchers out there, so he is definitely a valuable asset to have in the coming years. Much as I love spring training, opening day/night is the holiest holiday in baseball. 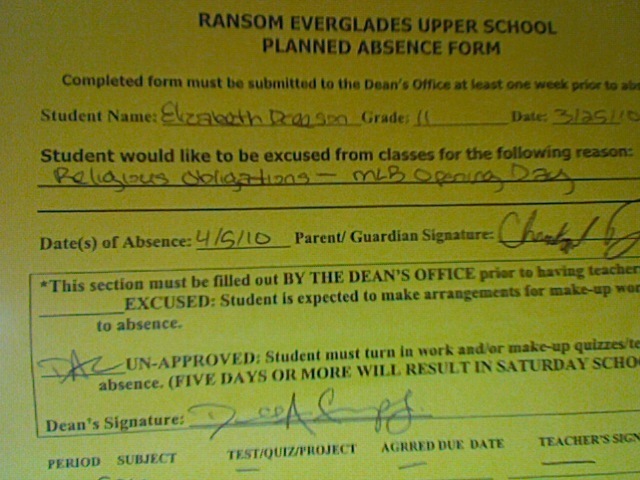 I obviously cannot go to school on Monday, that would be sacrilege! I’m so excited for the regular season to start; the end of spring training is just bittersweet for me. I should be getting back to you guys sometime on Saturday with my stories from Thursday and Friday. 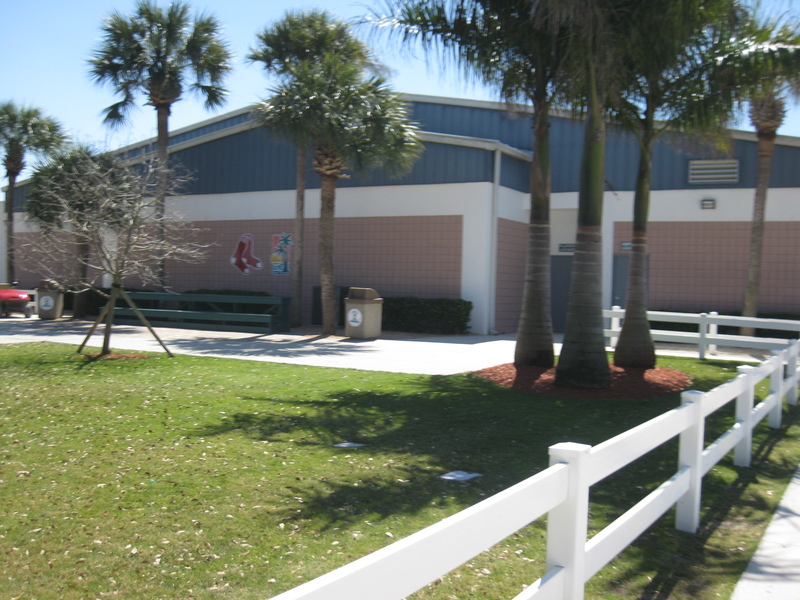 With the start of Spring Training quite literally right around the corner, the general media seems to be focusing on the obvious questions that the Red Sox are facing going into Spring Training. Of course there are a lot of “ifs” going into this season, but that’s not just for the Red Sox, that’s for all of Major League Baseball. So instead of trying to answer the same questions that everyone else is focusing on, I’ve got something a little bit different up my sleeves. At first, I thought that Spring Training was all about the Major Leaguers getting back into shape and preparing for the season. While it is certainly exciting to watch the Major Leaguers get warmed up for the regular season, we are forgetting a very important aspect of the team: the non-roster invitees. They are perhaps the most important part of Spring Training. The Major Leaguers already know their role with the team, but the Minor Leaguers are trying to find one. As many of you know, I have chosen “projects” for the past couple of years during Spring Training. These are the minor leaguers/prospects that I think will make it up to the big leagues sometime during the year… be it early on to substitute for an injury, or as a September call-up. Either way, it is so gratifying to see them finally make it to the Majors (and even more so to succeed), and it breaks your heart when they have a tough night. I encourage you all to choose projects. I’ll start with the prospects that I am familiar with that will be present during Spring Training. 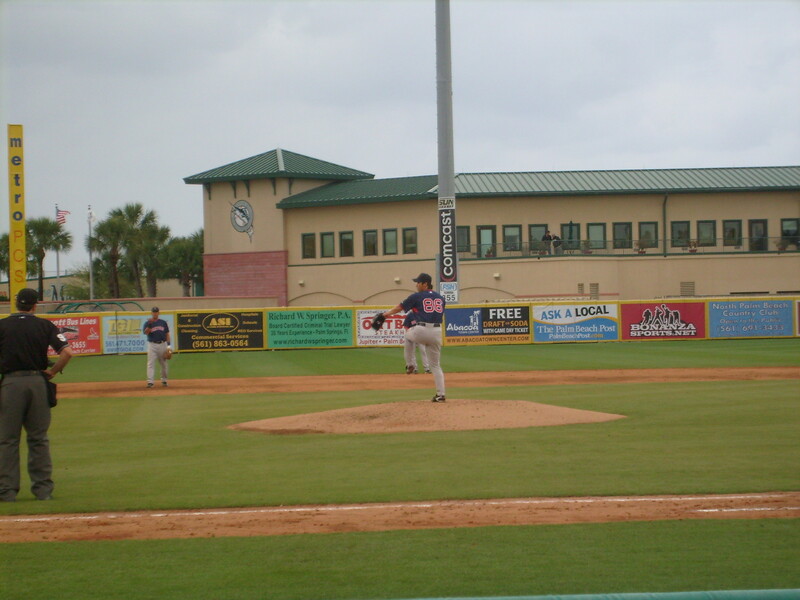 Among the pitchers I am familiar with (that were September call-ups or on the 40-man roster) are Michael Bowden, Fernando Cabrera, Felix Doubront, Dustin Richardson, and Junichi Tazawa.Bowden made his Major League debut against the Chicago White Sox in August 2008. He also made a start against the Yankees on April 26, 2009; the night Jacoby Ellsbury stole home. He struggled a bit when he was called up during the later part of the year, but I do not think that we can blame him for this. Bowden has been treated as a starter for his whole career in the minors, but he was put in the bullpen during his short tenure at the end of the season. He was brought in at stressful situations to “stop the bleeding”, and he struggled. Think about how starters are treated in the postseason: if they are available in the bullpen, they are ONLY brought in at the beginning of innings, when it’s clean. So please don’t judge Michael Bowden too harshly. He’s a great guy whom I have a lot of confidence in. Nevertheless, I think that he should be prepared to handle bullpen situations because he could end up following a path similar to Justin Masterson’s. Fernando Cabrera and Dustin Richardson’s names might also be vaguely familiar to you. They were also September call-ups, and both saw some Major League action, albeit short. I was very impressed with the both of them, and I have been excited to watch the two of them in Spring Training since the end of last season. I noted last year during Spring Training that Richardson had great mechanics, throws hard, and has good command. He gave up a walk-off home run against the Orioles at a Spring Training game I was at, but this is a guy that we seriously need to keep our eyes on. Although Boof Bonser seems to be the favorite to get the bullpen spot, don’t be surprised if Richardson surprises everybody. I don’t have many notes on Felix Doubront, but I do remember being impressed with him last year during the Spring. He is one of the top ranked pitching prospects in the organization. I will certainly be keeping my eyes on him during the Spring. I noted last spring that Tazawa had great form and a fast delivery; he was already pitching at a Major League level. He also has a nice breaking ball. I am familiar with both Dusty Brown and Mark Wagner; the former was a September call-up. During my time in Pawtucket last summer, I noted that Brown reminds me of Varitek in the way that he has a great sense of his surroundings. I think Brown has a lot of potential; especially if he can become more consistent at the plate. I don’t have much on Wagner, but I know that Bowden is very comfortable throwing to him since he’s just like a target behind the plate, and he has a great arm. As for the rest of the fielders that are on the 40-man roster (but not the 25-man roster) that I am familiar with are Aaron Bates, Jose Iglesias, and Josh Reddick. Aaron Bates got a bit of Major League action last season, but not enough that we can judge him by. Remember that we have to give all of the call-ups a bit of time to adjust. When I was in Pawtucket, Bates had just been promoted from Double-AA. He had a Triple-AAA swing with at Double-AA eye, which was OK because it was literally his first day. Bates is big, has a nice swing, and makes good contact on the ball. Trust me, keep your eye on him during the Spring. Jose Iglesias is a name that many of us are familiar with, but it is his abilities that we are not yet acquainted with. His defensive abilities have been raved about–he has even been compared to a young Nomar Garciaparra. I am very excited to watch him during Spring Training. 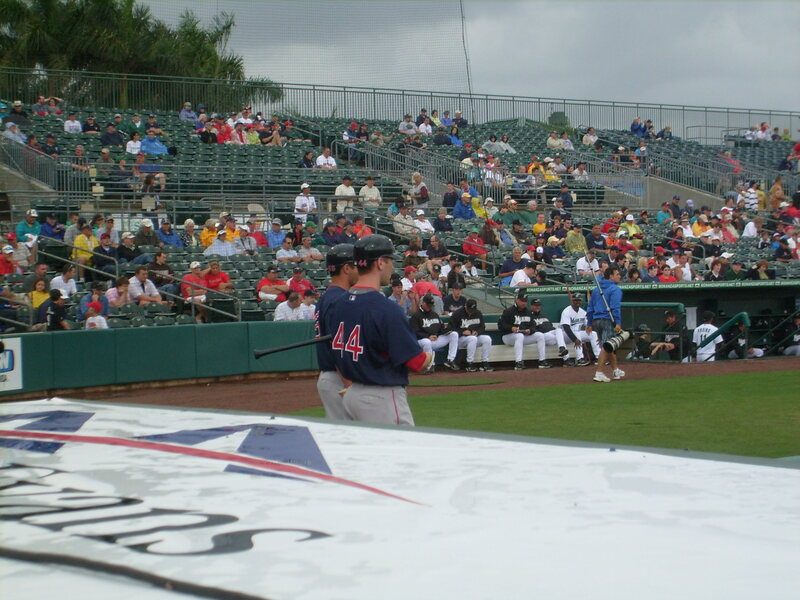 Josh Reddick is a guy that I have liked since I saw his first at-bat last year during Spring Training. I don’t think he was one of the original Spring Training invitees, but I noticed something special about him in his very first at-bat. He is a fantastic hitter. The main thing he was lacking was confidence, and I think that has definitely built up. He is also really good at bunting, and a great defensive outfielder. On to the non-roster invitees! I’ll start with the pitchers again. Technically, Fernando Cabrera is on this list, but I included him with the September call-ups because he was there. I remember watching Kris Johnson and Adam Mills pitch last season, and virtually everyone is familiar with Casey Kelly. Adam Mills looked pretty good last Spring, but he’s definitely someone I need to see more of this year. I didn’t see much of Kris Johnson last spring, but I did like what I saw, and I hope to see more of him. Kelly is arguably the top ranked pitching prospect in the organization, but he needs to focus on fighting for a spot in Double-AA Portland. He is nowhere near ready for the Majors yet because he is still so young. We will see a lot of raw talent out there, and I can’t wait. I am vaguely familiar with Luis Exposito. I haven’t seen him play yet, but I have heard great things about him. He is a young catcher, and he is supposed to be very good. In a few years, he could be the backstop, and V-Mart could move to first. with lots of home runs, but lots of strikeouts. Anderson had a nice Spring, and he’ll be a great guy to have in the future… he could serve as a fine designated hitter or a great first baseman. Velazquez is a fantastic infielder, and a utility one at that. I can tell he is very hard working, so keep an eye on him during Spring Training. 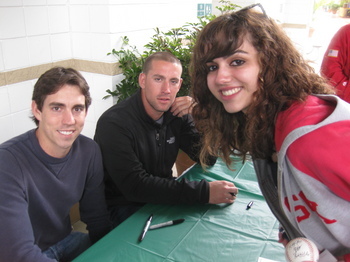 Finally, the two outfielders with whom I’m familiar are Zach Daeges and Ryan Kalish. Daeges is a utility outfielder, which is a great attribute to have. He has an interesting batting stance, but I like it. I’ve never seen Ryan Kalish play, but I’ve heard fantastic things about him. Some of you may be wondering where Ryan Westmoreland is. After all, he is the 27th ranked prospect in MLB and arguably the top prospect in the organization. Despite this, he is still only 19. He does not need all the speculation that will come with being in Spring Training yet. He’ll be there next season though. I cannot wait to watch all of these guys play during the Spring. Pitchers and catchers reported to their respective camps today, which is a sure sign that Spring Training games are right around the corner! For the Red Sox fans who read this blog, I hope that you will keep an eye out for these guys. For those of you who are fans of other teams, like I said before, I hope you pick your own projects! Chemists have a sense of humor, although it is a bit cruel. Today in my chemistry class, we were working on a lab, the biggest lab of the year. We have to identify an unknown substance, and so far I am convinced that it is crack. Today, we were doing gravimetric analysis (I still don’t know what that is) and we had to filter out our precipitate (the thing that went to the bottom of the beaker after the reaction) and we used a ‘Buckner Filter’. When my teacher first described the procedure, my friend Kathleen (another Red Sox fan) and I looked at each other when we heard ‘Buckner’. A little while later, I let out a small laugh during the procedure. Me: ‘Ha, that’s clever. Buckner filter. Because things go right through filters. Just like that ball went right through Buckner’s legs’. Kathleen: ‘It looks like chemists actually have a small sense of humor. Although, this one could have either been a bitter Cubs fan or a Yankee fan’. I don’t know if this is actually named after Bill Buckner, but when you think of the similarities, it’s almost undoubtedly named after him. It is becoming more evident that blogging is becoming a significant new sphere to bring news and opinions to an audience. This is how Curt Schilling announced his retirement– on his blog, ’38 Pitches’. Believe me, I am not surprised that he retired. In fact, I thought that he would retire after the 2007 season. That look on his face when he was leaving Game 2, and then when he tipped his cap– I knew (or at least, I thought) that would be his last pitch. We all know how incredible Schilling was, and he will mainly be remembered for his outstanding performances in the postseason. He went 11-2 with a 2.23 ERA in 19 starts during the postseason. One of the most interesting things to me about Schilling is the fact that he is motivated by his intense fear of failure. I don’t know if I could be motivated by a fear of failure, I think it would make me too anxious. I mean, I fear failing chemistry but if I think about that too much than I perform poorly on the tests. So I think that it is really admirable that Schilling can be motivated by his fear of failure. I know that everyone is probably pretty tired of the ‘Bloody Sock Story’, but I am still pretty impressed that Schilling had surgery on his ankle only two days before one of the most important games in Red Sox history. I am really going to miss Curt’s presence, and I hope that he will return someday as some sort of coach for the Red Sox. 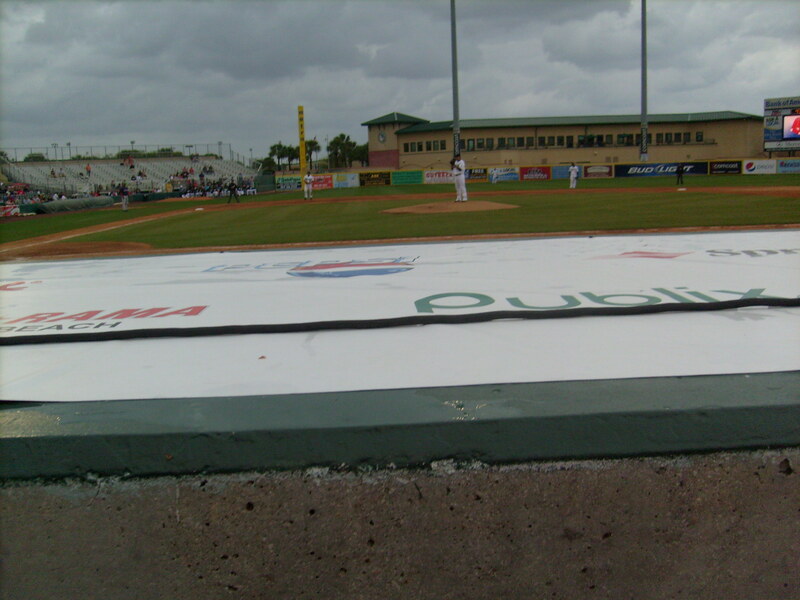 Although my bag was completely soaked, I was still able to pry apart the wet pages of my legal pad to take notes on the game– from behind the dugout. Our seats were great to begin with anyway, but since so many people had left already, how could I deny myself the opportunity to sit right behind the dugout? I was very well behaved too, I wasn’t obnoxiously yelling at the players. I gave him a concise (yet still thorough) breakdown on how I thought we matched up. Pretty evenly if I do say so myself. After I finished talking he said, ‘Alright! Let’s go to Vegas!’. I bet a lot of people at the game were disappointed with the fact that Jason Bay was the only regular starter playing. But I wasn’t. 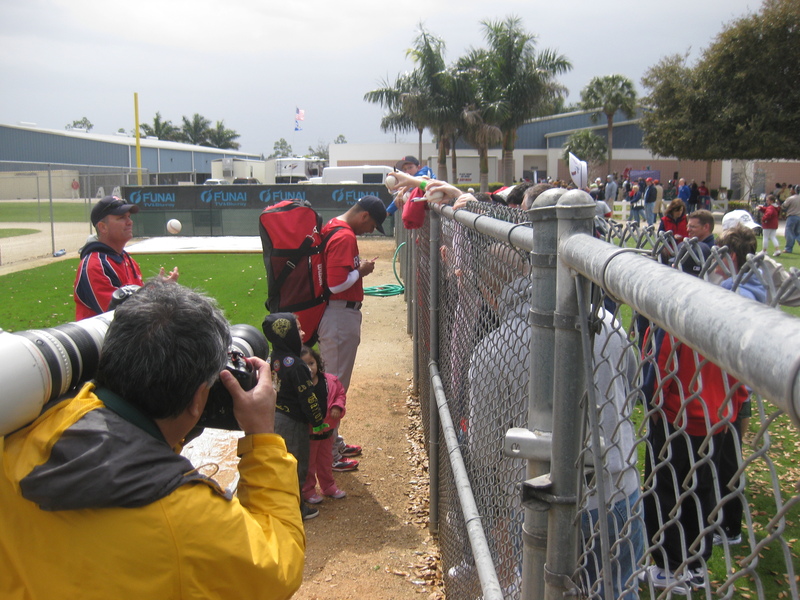 I have come to love the minor leaguers with their work ethics, and their willingness to sign autographs. Michael Bowden looked amazing, definitely his best outing of the Spring. He was exhibiting great command and has a great fastball and a beautiful changeup. I cannot wait to see more of him in the Majors. I am thinking the Justin Masterson process: Come up a few times during the year, and then stay with us during September. 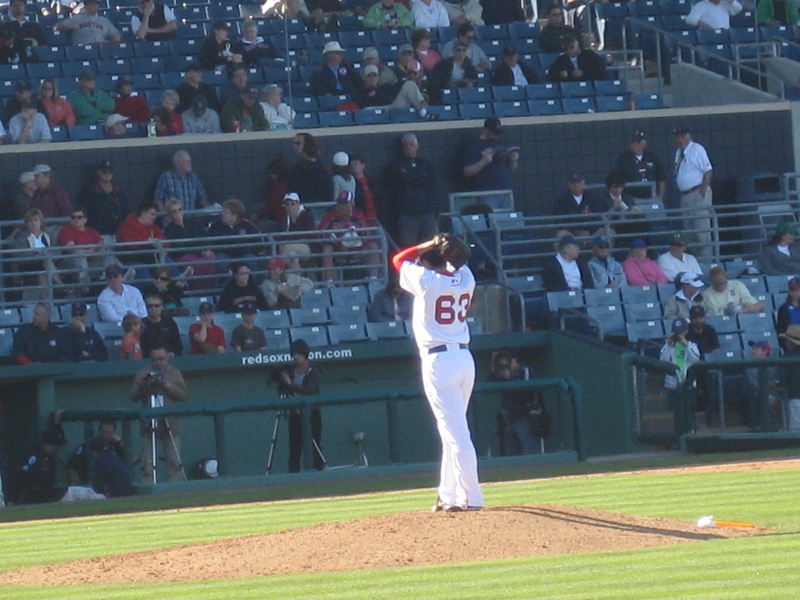 Junichi Tazawa (this is for you Jacobyluvr!) continued to show some great form, and a fast delivery. It is incredible how quickly he is assimilating to the big change between Japan and America. He doesn’t seem to be struggling, and I think that the Red Sox are going to want to hang on to him. He is already pitching at a Major League level so can you imagine how he will be after a year of extra work in the minors? It’s very important not to move too fast, we learned that lesson with Clay Buchholz last year. Overall, this game was all about the defense. George Kottaras is stepping up to the plate (or rather behind). He has a great throw down to second, and that is becoming increasingly important in what we want in catchers. I think that the Red Sox are looking more for a defensively sound catcher than an offensively sound catcher right now. 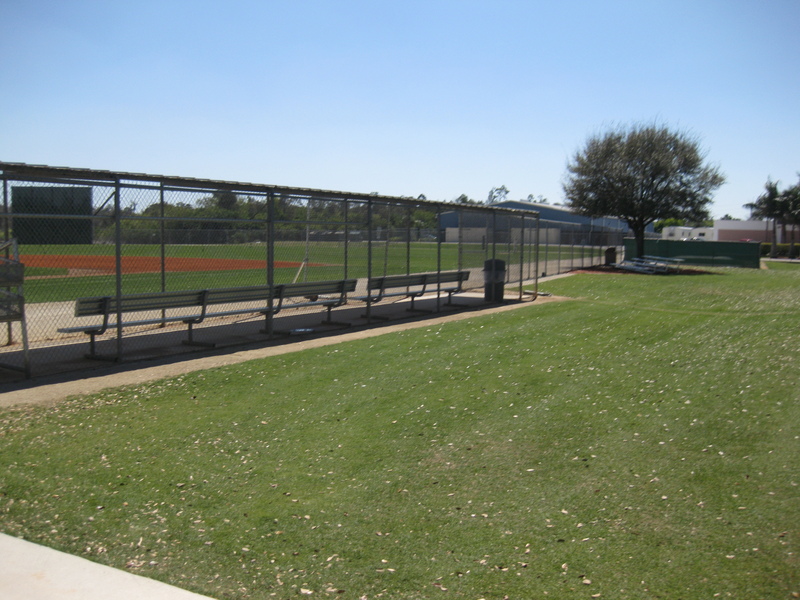 outfield, which consisted of Jason Bay, Brad Wilkerson, and Jeff Bailey all showed off some great arms. A lot of the time, I think that defense is underrated because as of late, everything has been measured on lots and lots of hitting. We have to remember that it is important. I have to say, Anibal Sanchez (the starting pitcher for the Marlins) looked great. He had a no hitter for five innings until my project, Nick Green, broke it with a single. Unfortunately I was unable to stay for the whole game. We had to meet my grandparents for dinner, and I didn’t really want to persist seeing that my mother agreed to go to the game two and a half hours early, sat through the rain delay, and through the game. What a great finish to the WBC, but more on that later. I have got to go consume as many vitamins as possible to avoid being sick! Today, I realized something– I can tell you more about baseball than I can about global issues– way more. I honestly did not know the name of the North Korean dictator until this afternoon. Is this bad? I remember Jane mentioning a story similar to this in her book. She was reading the newspaper and some kind of headline like ‘The Tribe is Suffering’ came up, and she thought it was about the Cleveland Indians. I’m not going to lie to you, upon reading it, I thought she was referencing the Cleveland Indians as well. I live in my own little baseball bubble as well. For example, in math today, when my teacher asked me the scores of the World Baseball Classic from Sunday, I was perfectly able to recite that. When he asked me to find the external arc of a circle, I was clueless. During my Life Skills class, we began learning about drugs; so we were each assigned a drug to research and present to the class. I kindly forced asked the student next to me to switch topics with me so I could write about steroids. Don’t get me wrong, I will talk about steroids in my project, but I think I’m going to go on a long tangent about steroids in baseball, and then go on to talk about Pete Rose and how it’s ridiculous that he is not in the Hall of Fame. I had heard about the rumored Jon Lester deal yesterday, but it wasn’t until I was watching Team USA beat up on Team Venezuela that I heard that the deal was finalized. It was a five year deal worth $30 million, with a $14 million option for 2014! This is what the Red Sox have been doing all offseason: locking up their proven young players! We all know that Jon Lester had a breakout year last year. I don’t need to re-emphasize his no-hitter and that great comeback story of his. The bottom line is: he is a good pitcher. He has great command of his fastball, and is even working on a changeup! At this pace, he is on the track to becoming one of the most feared left handed pitchers of the game. A-Rod is officially having surgery, though, not the same surgery that Mike Lowell had on his torn labrum. I think this is “arthroscopic surgery” and they few medical terms that I know are the ones that I have heard of on ‘Grey’s Anatomy’. This is not one of them. However, from what I have gathered, this surgery will allow A-Rod to return in 6-9 weeks rather than 12-16 weeks. This was the right decision. Like I’ve said before, it was painful for me to watch Mike Lowell play last season, and it was painful for him. If it’s already painful for Alex, it was only going to get worse. This surgery will minimize the damage, and he will have the rest of the surgery after the season. Plus, this gives A-Rod some down time. With this steroid scandal, and his inability to keep a straight story, and all Torre’s blows to him– he needs some time off. So what are the Yankees to do in the meantime without their cleanup batter? Alright so they have Cody Ransom to fill the void at third base, but that does not fill the offensive void. The Yankees are going to have to totally re-work their lineup. Sure Mark Teixeira has a bat, but other than him, the offense is a tad on the mediocre side. Luckily they have some serious pitching to balance that. The USA is redeeming itself after the 2006 tournament as it did not falter after its first win. They beat Team Venezuela 15-6 thanks to some key hits off of the shaky Venezuelan bullpen, and some strong relief pitching. Roy Oswalt had a decent outing, but definitely not the best. The problem is, these games actually matter (in a sense). This is still Spring Training to some of these guys. The guys on international teams have been playing Winter Ball. These guys? This is just the start of stuff for them. The US broke it open in the sixth inning by scoring eight runs. Mark DeRosa hit a triple and batted in a total of four runs. Chris Iannetta had a great bases clearing double and also had four RBIs. I have to say, I’m pretty impressed with Ianetta. Kevin Youkilis and Adam Dunn hit their second home runs of the classic, and Ryan Braun hit his first. Dustin Pedroia had a great play at second base if you guys didn’t get to see it. It was one of those plays that NO ONE should make. The bullpen was backed by some great run support so Ziegler’s two earned runs and Bell’s one were not that significant. 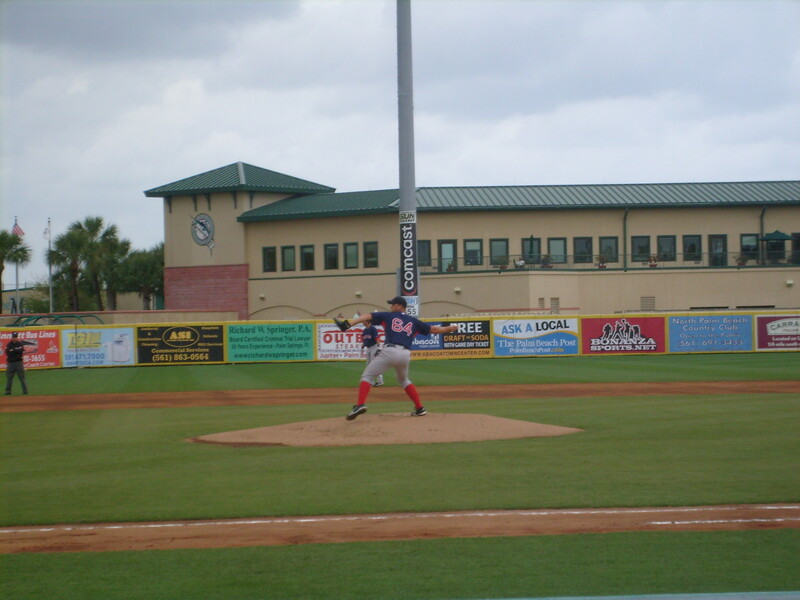 Matt Lindstrom of the Florida Marlins picked up the win. On Sunday I had to go to school for an American History catch up day– didn’t mind too much because I love that class. Anyway, the class started at one, and there was a Red Sox vs Rays game at one. Luckily, my friend lent me his iPhone so I was periodically refreshing the play-by-play throughout the whole class. Julio Lugo had a great day as he went 3-3 with two RBIs and two doubles. My project, Nick Green, hit a home run, as did Zach Daeges (despite his weird batting stance) and Jonathan Van Every. Justin Masterson pitched three beautiful innings of one hit ball and was followed by Jonathan Papelbon, who threw a scoreless inning but allowed two runs. Did I mention that he is working on a slider? Yet another pitch to vanquish victims. 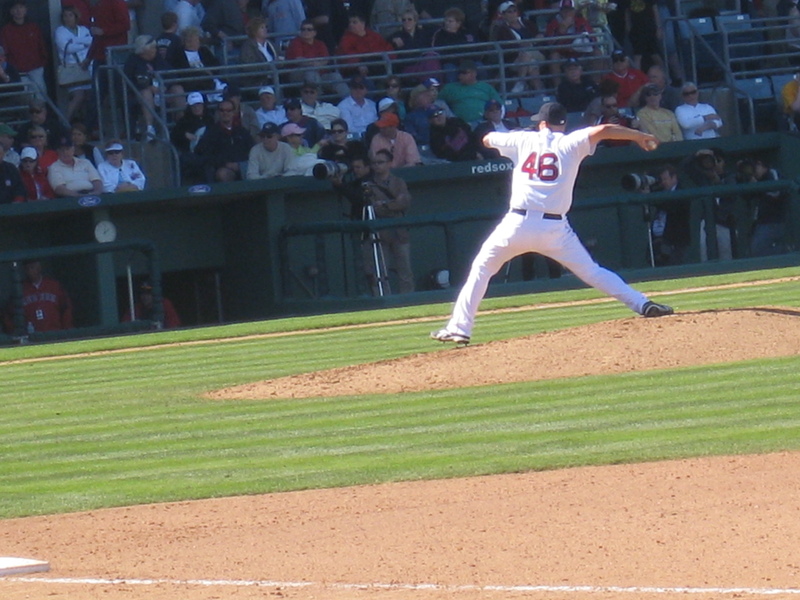 Daniel Bard (potential project) struck out the side, and Junichi Tazawa and Michael Bowden each allowed one run. I have now set a goal for Michael Bowden: one outing without any earned runs! The Red Sox played an exciting game today against the Pittsburgh Pirates, which the Red Sox won on an RBI double by Josh Reddick in the bottom of the tenth. I watched the first two innings during my Life Skills class while “researching” steroids. I wasn’t just going to pass up that opportunity. One of my projects, Jeff Bailey, went 3-4 with a double and an RBI. Project Nick Green hit another home run as did Dusty Brown. 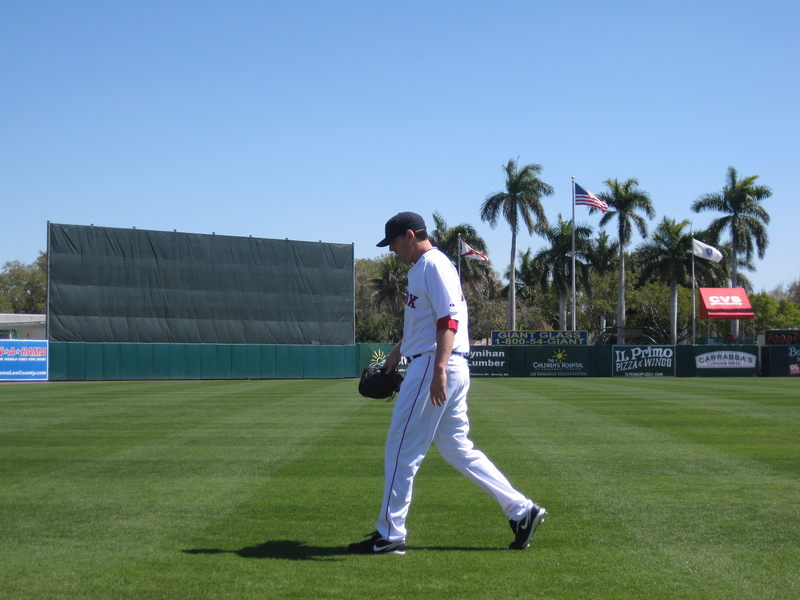 I remember Dusty Brown from last year’s Spring Training and from a Pawtucket game. I like him, but I need to see a bit more of him to decide his project potential. make his presence known by hitting another home run today and collecting three RBIs. I’m thinking that this whole competition thing is making Lowrie a little nervous. I just want him to be himself, because I know he can do well either starting on off the bench. Continuing in the tradition started by Jimmy Curran over at Baseball, the Yankees, and Life; I am dedicating my latest ranking, number five, to a former Red Sox player that has a very special place in my heart. 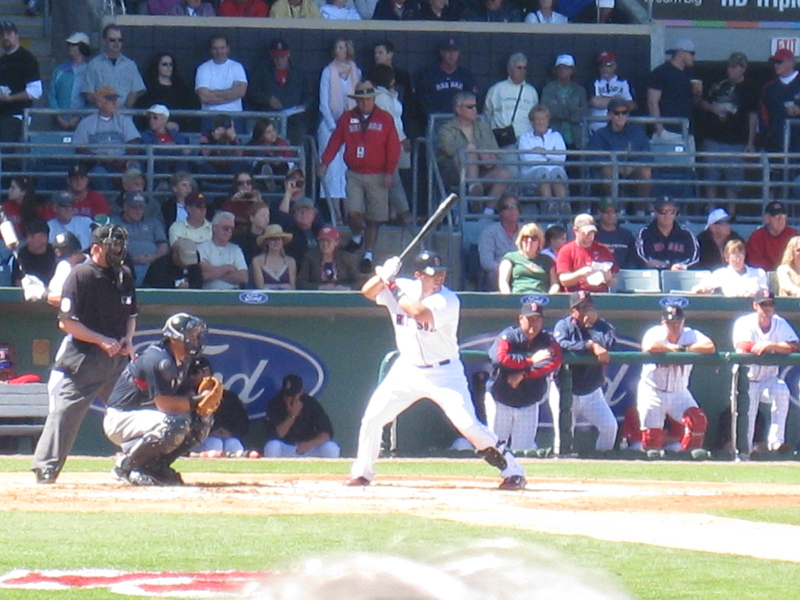 Nomar went to Georgia Tech, along with Jason Varitek (who had his number retired), and helped the “Yellow Jackets” get to the College World Series in 1994. He was a first round pick for the Red Sox in 1994, and played three years in their minor league system. He made his Major League debut in August 1, 1996, and his first major league hit, which happened to be a home run, came on September 1. It’s not like he was playing everyday though, John Valentin was the starting shortstop at the time, but not for long. 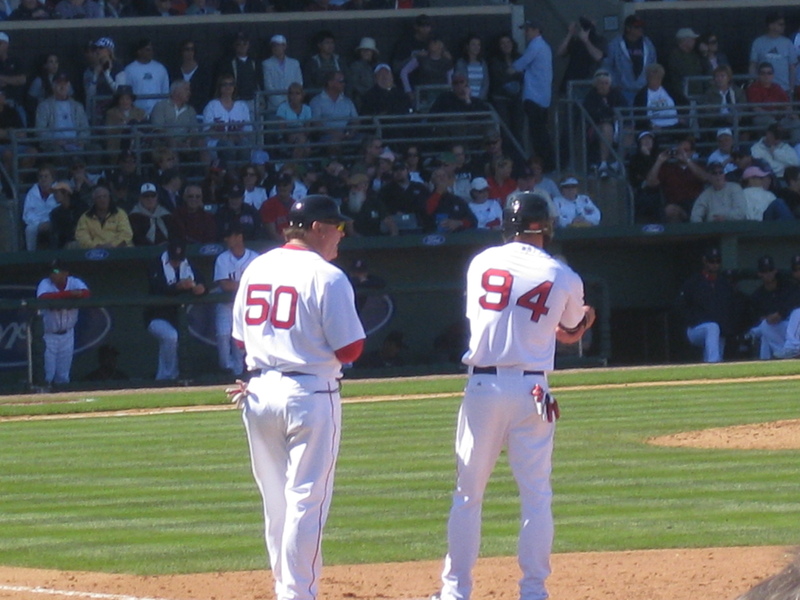 By late 1996, Nomar had taken the job– Valentin moved to second base. Garciaparra’s rookie year was 1997, and he hit 30 home runs, and had 98 RBIs, which set a Major League record for RBIs by a leadoff hitter. He also set the record for leadoff home runs by a rookie. Do you guys know who broke it? (Hint: It was another shortstop). He had a 30 game hit streak which also set an American League rookie record. He was unanimously voted Rookie of the Year and even finished eighth in MVP voting. In 1998 he finished with 35 home runs and 122 RBIs, and runner up for MVP. For the next two years, he led the American League in batting average. .357 in 1999, and .372 in 2000. He didn’t even win MVP those years. In 2001, the injuries began. 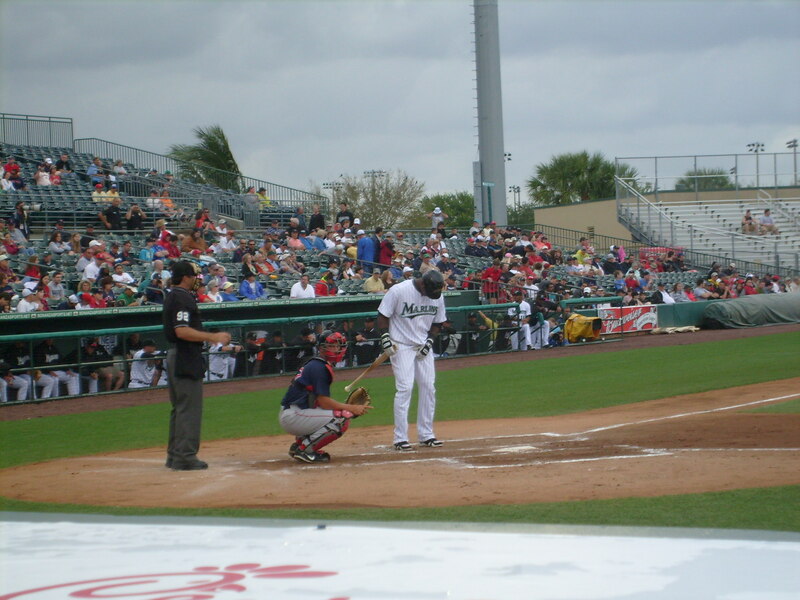 His season was ended when he came into Spring Training with a wrist injury and returned in 2002 to bat .310. It was the beginning of the end. Following a dreadful end to the 2003 season (Nomar did okay, but the Red Sox didn’t), the relatively new Red Sox ownership was investigating the idea of trading Manny to Texas for A-Rod, and Nomar to the White Sox for Magglio Ordonez. This obviously upset Nomar, and he became very unhappy. He was traded to the Chicago Cubs on July 31, 2004 for Orlando Cabrera and Doug (not even going to attempt his last name). Nonetheless, he was given a World Series ring from that year. God, I miss Nomar. For those of you that do not know, I have started a tradition of having “project players”. These are players that I see in Spring Training, or who may have a brief stint with the Red Sox, that I really like. Last year, Jed Lowrie and Justin Masterson were my projects. All of them are minor league players– you can check out my reports on them in my previous entry. Angel Chavez might make the list as well, he’s been looking great. 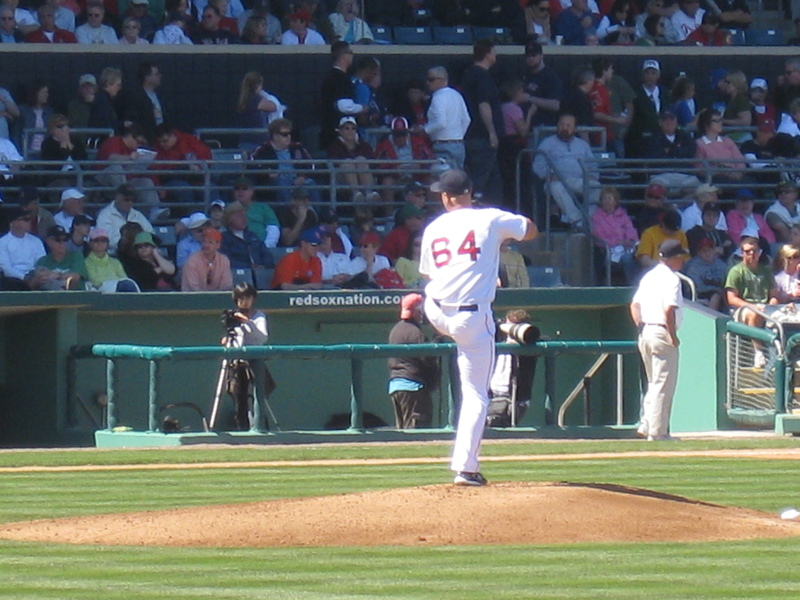 Thus far, we have seen three out of five of our starting rotation: Josh Beckett, Jon Lester, Tim Wakefield. 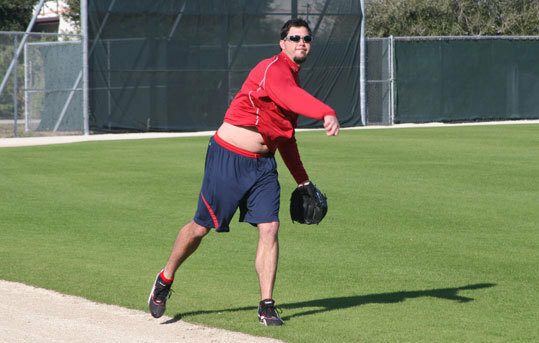 Josh Beckett has been looking great according to reports. The fact that he may look like his 2007 self is very pleasant to hear. Against Boston College, Beckett fired two innings and two strikeouts and didn’t allow any hits. Against the Twins, he also fired two perfect innings, but didn’t strike out anyone. The main thing for Beckett is to stay healthy. Some years he is incredible, others he is mediocre. Last season, he was always “catching up”– ever since that Spring Training game where he had the back spasms. 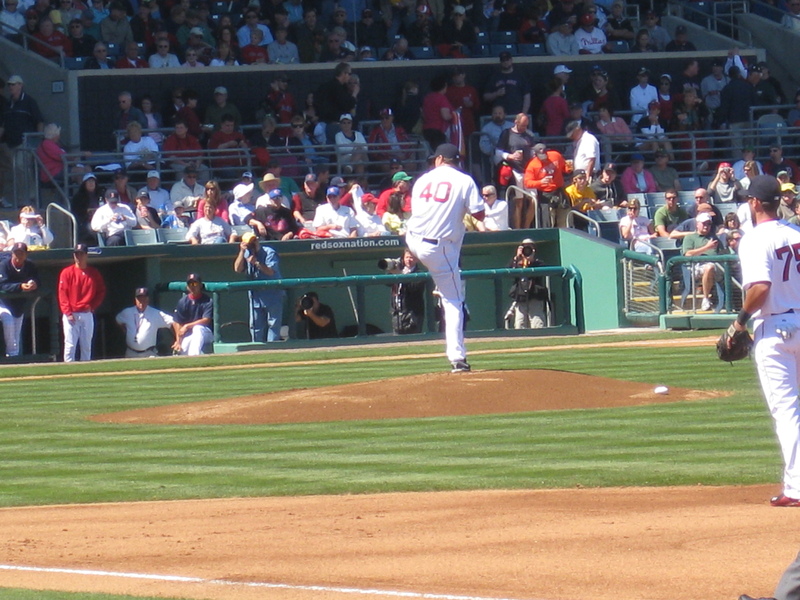 Jon Lester pitched against Pittsburgh and earlier today against the Reds. Against Pittsburgh, he pitched two innings, allowed two hits, and struck out one. Today, against the Reds, he pitched two perfect innings and struck out two in the process. Lester is working on adding a changeup to his arsenal of pitches. He is so young that he can continue to learn and really develop. 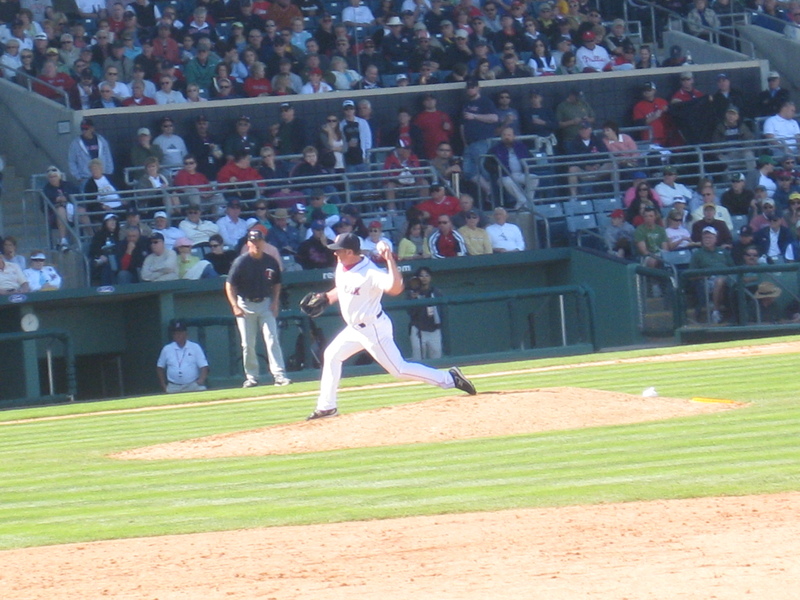 Wakefield, in his start against the Twins, gave up two earned runs on five runs in two innings. Coming out of the bullpen (after Beckett) in the second game against the Twins, he walked one, gave up one hit and no earned runs in two innings. The thing about Wakefield is that he is either on or off– there is very little middle ground. He basically has one pitch, and even though the knuckle ball may be pretty hard to hit for some teams– all it takes is two pitches to time it down. The great thing about Wakefield is that he goes very deep into games. We can’t tell much about Dice-K because he has been training in Japan this entire time for the World Baseball Classic, which is starting this weekend. I hope that they don’t overwork him. I know how much he means to Japan and his country, but there are 162 games in the season, and he has to pitch every five days for seven innings ideally. The thing about Dice-K is that even though he went 18-3, he walked tons of people, but got tons of run support. He needs to cut down on the walks (I know he can get out of jams, but I would rather him to deep into games). I’ll be closely watching him in the World Baseball Classic. Kevin Youkilis, Dustin Pedroia and Big Papi say they have some plans to hit home runs off him. Brad Penny will most likely be the fifth starter. He has not pitched in Spring Training yet, and he will not be starting against Puerto Rico. The biggest thing for him is also to stay healthy, because when he is healthy, he is great. After all, in 2007 he did finish third in Cy Young Award voting. Justin Masterson did a great job starting though. Kevin Youkilis could move to third, and either Lars Anderson, Jeff Bailey, or Chris Carter could come up to play first base. It would not be the end of the world if he can’t start on Opening Day. The main priority is for him to completely rehab. He is working out in Fort Myers right now with everyone else, but I would guess that if he is not ready for Opening Day, he should probably start out in Triple AAA just to get a feel for things. I can’t watch Spring Training games, which really upsets me. They’re always during school, so I can only check the score so often. Today, as I checked the score, I noticed that we were losing. Instead of freaking out, I checked the box score and checked out who hit and who pitched. Jed Lowrie had a good day, and Chris Carter got a hit too. As I was scrolling through the pitchers to see who had earned the runs, I noticed that Ramon Ramirez had three of the earned runs and four of the hits. He had looked so good before! Was it just a bad day?